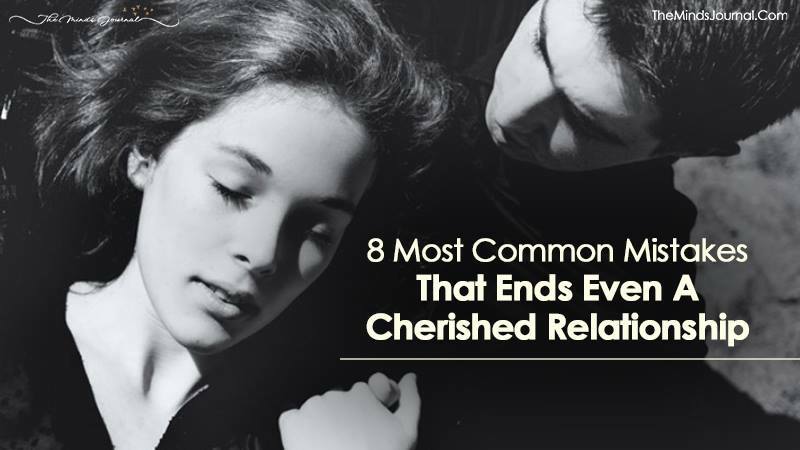 8 Most Common Mistakes That Ends Even A Cherished Relationship. Everything in this world is temporary and relationships are no exception. It’s all about what we make out of the time that we spend together. Some relationships last until death do the people apart while some fall apart when a chaos in the form of misunderstanding or repeated arguments enter their lives. No one is perfect; everyone makes mistake and even the strongest of people fall for this. There are few wrong steps that might take one towards the end of relationship they cherish so much. There are many instances where the high expectations from hopeless romanticism have taken relationships down the cliff. Relationships are not easy, they never promised to be. Despite being committed to someone we have a life which comes bundled with responsibilities and dreams. It’s not possible to always be all romantic and live your life to keep impressing the other. Sometimes we end up expecting way more from our partner and they don’t always stand up to the expectations. The disappointments caused in this process slowly poison your relationship. Let your partner be and if you want to expect something from someone do it for yourself. A relationship is not a piece of cake, of course, a relationship is supposed to make you happy but you need to put in your efforts and dedications for that. No! it’s not okay to lie a little. No matter how bad it is but you will always speak the truth. Lie no matter how big or small is a lie at the end of the day, it shows that you don’t trust your partner enough to tell them the truth and also they should not put their faith in you. Loyalty and honesty are pillars of a relationship. You cannot just lie and cheat on your partner and expect your relationship to keep going smoothly. There is nothing as bad as cheating in a relationship. Sometimes, when you really are deep in the midst of a bad relationship, you don’t even acknowledge one another. You always need to remember that it’s no more just ‘you’ or ‘me’ is ‘we’ and ‘us’ now. Even the strongest of relationships lose its magic when they don’t share enough time together. The relationship is not a noun but a verb, it requires efforts, dedication and your time. If you’re someone who cannot afford to give your time to someone, you better don’t get into a relationship. After all, time is the most precious of gift you can give to someone. If you’re not happy and content yourself, it’s wrong of you to expect someone else to do it for you. There are times one partner gets deeply involved in a relationship and starts seeking the source of happiness in others, this leads you nowhere but in a world of expectations and disappointments.